Are you tired of weaving in zillions of ends when you crochet stripes? This tutorial demonstrates how to carry yarn up the sides of your work. This technique will help you save time when you are crocheting stripes; it will eliminate the need for weaving in an excessive amount of ends, leaving you with only a few at the beginning and end to deal with. You'll need two different colors of yarn: color A and color B. You'll also need a crochet hook. 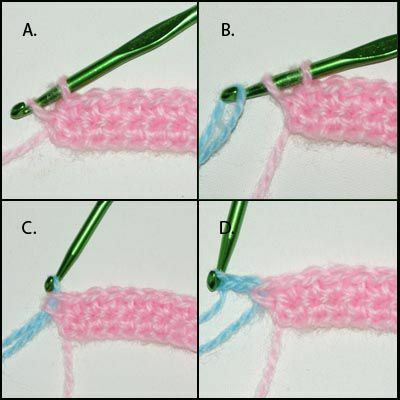 In our sample swatch, we're using baby pink yarn as color A and baby blue yarn as color B. Pull it through to complete the stitch. (View C.) Do not cut color A! That's it, in a nutshell. From here, you just keep repeating those basic steps every time you change colors to make a new stripe. Views I and J show another color change, completed exactly the same way. View K is a close-up photo of the side of the Afghan block; this picture shows how the carried yarns will look. View L shows how the sides look after several more rows have been added to the afghan block. View M is a photo of the block before the edging has been added. View N is a close-up photo showing how that same edge looks after an edging of single crochet has been added over top. See how well the edging hides the carried yarns? You can't even tell they are under there. When you are crocheting a stripe or colorwork pattern in a color that will be used again within several rows. For example, the striped pattern shown in this tutorial is ideal for use with the technique, since both colors are used frequently and within a few rows of each other. When you are crocheting a project that will have either side seams, an edging, or some other means of hiding the carried yarns. For example, this afghan block was completed with a simple edging of single crochet. This technique could also be successfully used to create sweaters, where the carried yarns will be hidden in the side seams of the garment. If you're using a color that won't be repeated again for more than a few rows, carrying the yarn up the sides is not a good idea. In that case, go ahead and cut the yarn. Even then, you aren't necessarily doomed to weaving in lots of ends. Depending on the colors and yarns you are using, you might be able to crochet overtop of the ends, which may be easier and quicker than weaving them all in. If you're working on a seamless project, and you don't plan to put an edging on it, you'll have to evaluate whether the pitfalls outweigh the benefits of carrying your yarn. One of the downsides to this technique: Things can catch on the carried yarns if you leave them exposed. It's really preferable to bury them under edgings or hide them in seams. If you don't camouflage the carried yarns, you'll have to put up with the risk of the yarns catching on things when you use/wear the finished project.